How do you describe your work, Wanda? I have been using the title Wanda's Creations for a while now, I mainly started using it on my earring cards and now I use it online also. I chose it because people would make comments about "my creations" so first I used Creations by Wanda, but that was soon changed to a more simple title. About 6 years ago I got remarried and moved about 40 miles from my children and grandchildren. At first my husband was working 5-6 days a week and sometimes he would have to work 7 days a week, and this was from daylight to dark usually. I was home alone all day because everybody else around worked too and I was going stir crazy, there is only so much TV a person can watch. I used to sew so I went and bought some fabric and started making childrens clothing and some other items. Some friends of mine was into jewelry making and I had went to their home several times and would get to see their jewelry and bead room and it was love at first sight. I think I went to Walmart and bought my first beads, but soon I found out about FMG and the different sellers on Ebay and my collection started growing. I started basic stringing to begin with but gradually learned how to make loops with head and eye pins on beads for earrings and to use for necklaces and bracelets. I recently began learning bead weaving stitches starting with right angle weave, then adding netting, ladder stitch, triangle weave and now I want to learn how to do the peyote stitch which is hard for me but I hope I conquer it soon. What is your creative process like? My creative process is different sometimes! Sometimes I can just choose the beads I want to use, sit down and put the piece I'm working on together with no problems. Then sometimes it's more complicated: I'll choose the pattern I want to use but it will take a while to choose the colors and type of beads. 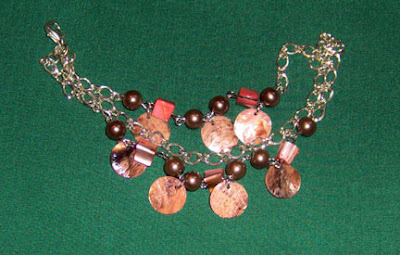 I usually use the type beads the pattern calls for but sometimes I will substitute a different type of the same size. I use a desk as my beading table and to keep from losing all the beads, I use a velvet lined tray and sometimes I will add a beading pad to it, other times I'll just put the beads in the tray. I'll put my beads in separate piles, for example, if I'm using crystals, seed beads and glass pearls, then I put them in the order they are in the pattern. As for music or silence, it depends on my mood. Some days I'll turn the television to CMT or GAC and listen to music, some days I'll turn it to the Food Network channel and listen to my favorite cooking shows and some days I want complete silence, mainly depending on how complicated the pattern is. Sometimes I'll work on a piece or a set for several hours but usually I have to get up and move around so I'll break it up into smaller chunks of time. I recently made a set using Michelle Skobal's Picots and Pearls pattern (shown above) and it took quite a while to make, several days actually. I'll make earrings and depending on the pattern, I can make several pair in the course of a day or partial day. What kind of training did you have which helped you achieve your current level of artistry? I have no formal training, I have taught myself by trial and error, a lot of errors and ripping out!! I would like to maybe someday learn enough that I can create my own bead weaving patterns. I am finally getting to the point that I can change a pattern to use a different size bead that it calls for and make it work right, so hopefully one day I'll get to the point that I want to be at. Is there a tool or material that you can't imagine living without? Actually there are 3 tools that I can't imagine living without, especially if I'm going to be using wire. And that is my flush cutters, 3 in one tool that I use to make my loops and my basic pliers, although I do use bent nose pliers sometimes. I think I would be happy just to give the wire up completely and just do the bead weaving patterns. Lately my inspiration is the patterns and beads that I am using. 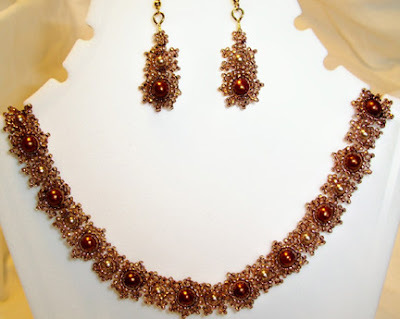 I love the sparkly Czech and Swaroski crystals and Deb Roberti creates some beautiful patterns using them. 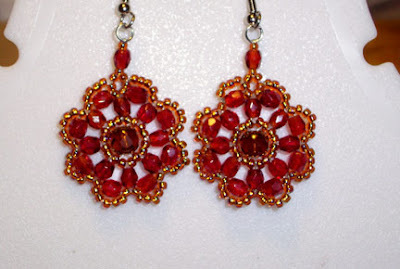 When I first saw one of her patterns I said that I WAS going to learn those stitches and be able to make the earrings. I did learn how to do them and have made several pair of her earrings. Also Michelle Skobal's patterns have gave me lots of inspiration and I have used several of them recently. What inspires you to keep going when the work gets frustrating or tough? I suppose the thought of how a piece of jewelry will look when I finish it is what keeps me going but sometimes when I get frustrated, I have to put a pattern aside and come back to it later. So far I have never completely given up on a pattern, but I have several that I plan to make in the near future and they look very complicated so there may be a first time for that soon. What is your best piece of advice for those who would like to rise in their level of artistry? I think my best piece of advice would be that practice makes perfect. If you really want to go to the next level, you have to put your mind to it and just do it. What takes up the majority of your time besides your art? I have a full life even without my jewelry making, with my husband, children, grandchildren and friends. I have 3 wonderful children, Michael, Jamie and Jessica, and between them I have 5 beautiful grandchildren ranging in age from 7-15, Kymberlee, Daniel, Destinee, Adam and Dylan. My husband Don and I both love to go fishing and we are members of Hillabee Archaelogical Society and attend several Artifact shows during the year. Between spending time with family and friends, I have plenty of housework and cooking to keep me busy but I always make time for my beads and jewelry. What's your favorite comfort food and other favorites things? I've never really thought about that before but I think it would have to be a Train Wreck, which is basically a loaded baked potato and one of my favorite restaurants uses the name Train Wreck. It has sauteed onions with lots of butter and sour cream, cheddar cheese and either fried or grilled chicken on top. My favorite colors are purple and shades of green, and I love almost any book by James Patterson. Wanda, beautiful designs! Thank you for sharing your story. I love reading these artist profiles. So many are self-taught artists. It really is inspiring and encouraging. Come on a journey through a bead and jewelry wonderland, where no item is considered too strange to use in making something ... especially if that item has a hole in it! All types of beads are welcomed and cherished here, and no techniques are off-limits. You'll be amazed and inspired by the handmade beaded jewelry and the bead embroidery that is being made today! 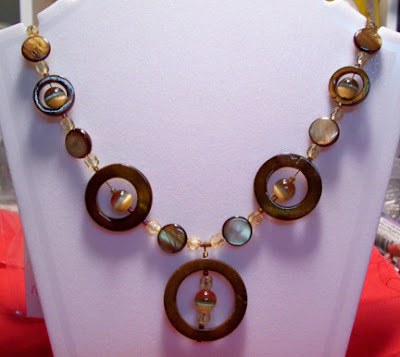 Bead & jewelry blogging round-up! Fabric flower necklace with zing! Totally Twisted blog tour and giveaway!! Winner of Glass Jewelry book! Make a difference with your art! Copyright 2019 Cyndi Lavin. Powered by Blogger.